I'll probably post small notes about particular lectures here if need be. Calculus I in a nutshell: a quick and rather complete review of Math 131 at Liberty University, enjoy! semester specific materials are found in Blackboard. There you will find the Course Planner which includes your assigned work and how the course is graded. My NCSU webpage (you'll find the old ed. of my notes in the ma 241 course). Concerning rearrangement of power series. Domain changing algebra. My lectures tend to follow these notes, however, sometimes I go deeper than classtime affords us time. Also, I do write these notes with an exceptional student in mind. I believe we are called to excellence not mediocrity. Of course, not everybody needs to understand the entirety of my notes. I just want you to do your best. Notice that I have only been able to put the first 40% or so of the notes into the LaTeX format. The last 60% are in my older, inferior, Word-based format (the whole 2nd-ed. of my notes is posted further down, and if you are really really curious you can find the first edition somewhere on this website...). Oldschool Calculus this pdf includes the Calculus I notes. I do reference these in many places. Most people need to read Chapter 2 again to refresh math lingo. The problems below were taken from Stewart's Calculus. The qualifier "prereq" means that I don't plan a specific lecture devoted to this topic. It is probably spread over many other lectures. I include these solutions specifically to help those of you who had a lackluster preparation before this course. OK, I hope the reason these solutions are posted here is clear enough. Sec. 7.7 Ch. 9 prereq. 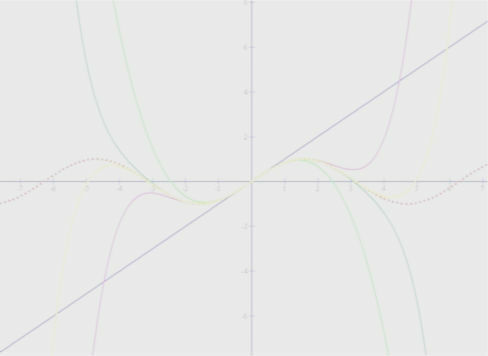 H2 = 9, 30, 31, 57, 58, 60, 63, 64 calculus of hyperbolic functions. Sec. 12.2 Ch. 17 Mar. 22 H17 = 10, 15, 31, 34, 42, 48, 56, 60, 67, 68, 70 geometric series, n-th term test. These give you some idea of the difficulty of the course. Also, while tests change from semester to semester these show you certain things you might expect. We start with Chapter 9 in calculus II. You do not need to print these. These are not the notes for this semester. That said, my approach in these notes is less formal than the approach I am currently applying to the calculus sequence. I expect more of my students in the current edition of my notes. If you surf through these documents you'll find over a dozen old tests, numerous quiz solutions and just plain old solved homework problems. There are solved problems like your homework for most of the sections we cover. Older extra credit project Solutions by Ginny. Warning, she's my wife so she doesn't have to show all her work. You do not have this privilige on the tests. Please ask me if you don't understand some step she made since her work is very concise. Test I solution from DEQns course, much overlap. convergence/divergence test guidewith box filled with the wise guidance of a fellow TA and a warning about what my focus is on for our section of ma 241.
geometric series trick chart my graphical representation of how to use the geometric series indirectly. This trick should be combined with some common sense to solve problems in section 8.6. Of course some problems are just plain-old geometric series, so try that first when attacking 8.6 questions. a selection of homework problems worked I work out a few of your homework problems. I deal with the endpoints for an example or two, but then focus on the main part which is the open interval of convergence. That just requires careful application of the ratio test. The endpoints require more thought sometimes. a selection of homework problems worked mostly even numbered problems, I hope these help you understand how to get started. These sort of problems reflect what I think is the most important element of power series. This is the part that you can use in other courses ( convergence and divergence is fine and all but if you can't calculate the power series representation of a function then the question of where it converges seems somewhat pointless ). Also the fact we can integrate almost anything with power series is just fantastic.